Protein Hydrolysate for Animal Feed Application Market size was over USD 545 million in 2016 and industry expects consumption above 245 kilo tons by 2024. Increasing demand for nutritious food for livestock along with growing awareness about animal health will propel the protein hydrolysates for animal feed application market size. They are used as a feed for various animals owing to its high nutritional value, thereby stimulating the industry growth. The product optimizes the growth performance of livestock including poultry, pig, goat, and cattle to produce meat, thereby propelling the industry growth. According to FAO, over 35 million tons of whole fish are discarded annually in commercial fisheries. Fish or fish waste is the main source of collagen and contains long chain omega-3 fatty acid, which also supplies nutrients such as vitamin D, calcium, and iodine. Global aquafeed market accounted over USD 80 billion in 2016 and it is expected to grow over forecast timeframe as well. Increasing aquafeed market and high quality aquafeed demand has risen in aquaculture industry along with increasing feed additives and hydrolysate feed consumption demand, thereby stimulating the protein hydrolysate market size. Animal nutrition industry is focused on giving proper nutrition for sustained livestock productivity, thereby propelling the industry growth. In 2016, North America animal feed additives market accounted at over USD 3.5 billion, which is expected to grow over the forecast timeline owing to strong application potential as growth promoter in poultry, swine, aquaculture and cattle feed., thereby driving protein hydrolysates market size. However, fluctuating anchoveta catches due to El nino phenomenon referring to the climate changes and season may obstruct fish peptide production thereby affecting the market growth. In addition, stringent environmental policies regarding fish catches mainly in Peru and China, which are the largest fishing nations where 85% catches are anchovy fish used for production of fish meal and fish oil should hamper industry growth. Animal protein hydrolysate for livestock food application market is projected to have above average gains at over 5.5% during the forecast period. These products contain greater amount of amino acids for newly weaned animals. Hydrolysed peptide for poultries is an ingredient formulated to improve the growth performance of livestock. Superior characteristics such as high digestibility, high palatability, and low ash content, which is essential for pet food, is propelling product demand. Fish protein hydrolysate for animal feed application market size is expected to reach over USD 320 million by the end of 2024. These products have excellent water-holding capacity and is suitable as growth performance and nutritious feed for livestock species including poultry, cattle, equine and swine, thus propelling industry growth. Milk protein hydrolysate for animal feed application market may witness growth of over 5.0% during the forecast period. It is produced to fulfil nutritional purposes and for physical functionality in pigs, broilers and layers which enhances overall growth and performance, thereby enhancing product demand. Plant protein hydrolysate for animal feed application market size is projected to reach USD 95 million at the end of 2024. Application of these products can also alleviate the negative effects of abiotic plant stress due to salinity, drought and heavy metals, which enhances the nutrient value in livestock, resulting into increased product demand. 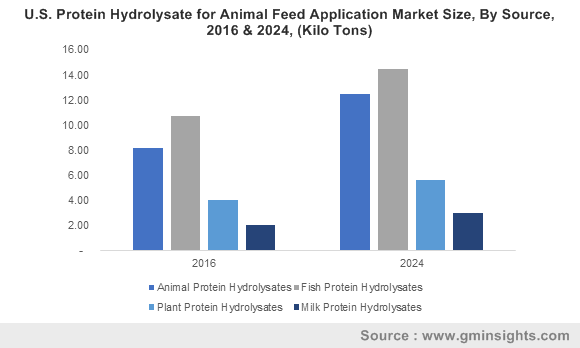 Protein hydrolysate for animal feed application market size from acid hydrolysis is projected to gains at 4.5% over forecast timeline. Acid hydrolysis achieves higher yields and is considered as a very common and a cost-effective method, thereby promoting market growth of the product for livestock food application. Protein hydrolysate for animal feed application market size from enzymatic hydrolysis is valued at over USD 540 million at the end of 2024. Enzymatic hydrolysis is a complex procedure owing to several peptide bonds compared to other technologies. This process also helps in improving functional properties such as foaming and emulsifying capacity along with providing high digestibility, thus promoting industry growth. Protein hydrolysate for animal feed application market size from poultry may witness gains at over 5% during the forecast time period. They are widely used for poultry feed owing to its high digestibility and nutrient value. These products are selected for the poultry diet as it provides palatability and voluntary feed intake, and cost effectiveness, thus stimulating industry growth. Protein hydrolysate from swine is projected to reach USD 195 million by 2024. It optimizes the growth performance in pigs and minimizes the inclusion of protein-rich feedstuffs. Soybean meal is considered as an economical source of amino acid for pigs in the U.S. Growing animal health awareness among breeders and manufacturers may have a positive impact on product demand. Protein hydrolysate for animal feed application market from aquaculture may register growth at over 4.5% during the forecast timespan. They have wide range of application in aquaculture industry as it helps in maintaining immune resistance, improving growth performance and provides nutritional benefits. Powder form of protein hydrolysate for animal feed application market size will witness gains at over 4.5%. The powder product is a dry and loose substance extracted from enzymatic and hydrolysis process of animal, milk, fish and plant origin. These products have elongated shelf life. and are highly soluble in water along with excellent amino acid profile, thus driving market growth. Paste form of protein hydrolysate for animal feed application market size is projected to reach USD 340 million by 2024. Feeding paste to livestock directly provides various health benefits including growth performance. Manufacturers such as Akola Chemicals, provides both the powder and paste form which is directly processed from soy, catering to various applications. North America led by the U.S. Mexico, and Canada protein hydrolysate for animal feed application market size should surpass USD 215 million by 2024. Increasing aquaculture industry along with investments in R&D systems and facilities for better product portfolio and growing consumption of fish and seafood will propel regional industry growth. Europe led by Germany, Italy, France, and UK protein hydrolysate for animal feed application market should registered a significant growth at over 4.9%. Major pork meat producers in the region are Germany and Spain wherein 59.4 million and 47.7 million pigs were slaughtered respectively followed by France. Substantially rising processed food and fast food industry, change in consumer preference of ready to eat foods and rising disposable income should propel regional livestock industry along with which animal feed market size is anticipated to grow, thereby propelling the protein hydrolysate market size in this region. Asia Pacific led by Australia, Japan, South Korea, India and China protein hydrolysate for animal feed application market should surpass USD 260 million by 2024. Increasing livestock farming including dairy cattle, horses, pigs, goat and sheep and raising of birds commercially for eggs and meat mainly in India and other South East Asian regions will drive the market demand for protein hydrolysates. Global protein hydrolysate for animal feed application market share is moderately fragmented with major industry players include A Constantino, Sopropeche, Boyer Valley Company, Diana Aqua, Copalis Sea Solutions, Akola Chemicals, Scanbio Marine Group, Hofseth Biocare ASA, 3D Corporate Solutions, C.R. Brown Enterprises and Nutrifish which cater products and services to local and international market. Many industrial participants are investing in regions where the government is taking initiatives to develop its infrastructure, thus strengthening regional presence. The market may witness consolidation in the form of mergers & acquisitions and joint ventures which may enhance product portfolio and strengthen global presence. Protein hydrolysates has increased usage in various animal feed industries owing to its special properties and characteristics. It is designed and manufactured through advanced technologies of enzymatic and acid methods to increase its quality and nutrient value. Increasing aquaculture industry and livestock industry along with awareness of healthy and safe feed should stimulate the product demand. These products offer good amino acid profile, in a high digestible format for livestock, which will parallelly stimulate the product demand.